May you rest in peace and forever be remembered! 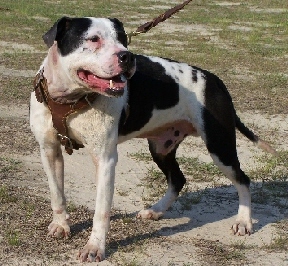 Old Glory Kennels is a quality breeder of the American Pit Bull Terrier. We have over 15 years of experience in preserving the Bandit/Sasha bloodline. Our dogs are bred with the specific intention of producing high quality American Pit Bull Terriers that conform to the APBT breed standard. Their superior athleticism, intelligence and perseverance to complete any endeavor coupled with a solid and outgoing temperament makes them an asset that will compliment any breeding program. Our sole purpose in providing our dogs to the public is the preservation of the historical Bandit/Sasha bloodline. They are sold exclusively for this purpose. All of our dogs are given the best of care, and all of our pups are registered with the ADBA and can be dual registered with the AADR. They are also vaccinated starting at the age of four weeks and wormed biweekly. We are active in the APBT community and regularly show our dogs in the conformation ring. We have campaigned two ADBA Champions, one AADR Grand Champion and five AADR Champions. Christy is an AADR sanctioned conformation judge. Any conversation in regards to any illegal activities will NOT be tolerated! ALL DOGS ARE BRED, RAISED AND SOLD FOR LEGAL PURPOSES ONLY!